We are pleased to share that the early WSU publication Wright Now, from the University Archives, is now freely available online, anytime, through the Wright State University Campus Online Repository, at CORE Scholar: Wright Now. Wright Now was a bi-weekly publication, created by the Wright State University Communications Office. 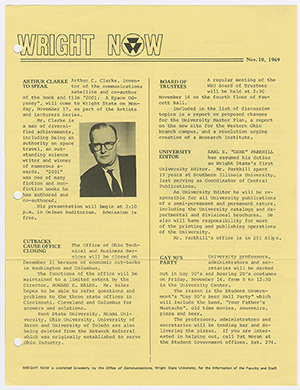 The Wright Now newsletter ran from September 1969 to December 1970 and informed the faculty and staff of news, events, programs, and professional accomplishments of the Wright State community. Each issue is generally 2 to 6 pages long and provides an interesting window into WSU’s early history. This digital project was a collaborative effort between the University Libraries’ Special Collections & Archives and the University Libraries’ Digital Services Department, which provided the digitization, metadata encoding, and uploading of digital content to CORE Scholar. This entry was posted in Collections, SC&A, University Archives and tagged collections, CORE Scholar, digital collections, new collections, news, University Archives, Wright State University. Bookmark the permalink.